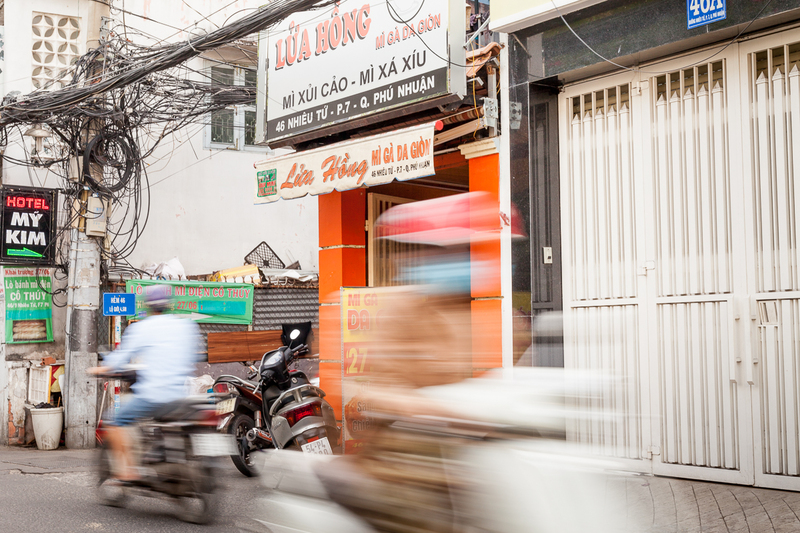 Nestled in a corner on Hoa Su Street in a close-knit residential area, Mi Ga Lua Hong, which offers up a solid addition to the host of chicken-centric dishes of Saigon: a fried chicken drumstick with dry, green noodles, is the star of Hem Gem. Fried chicken with two noodle options – green vegetable noodles and normal yellow noodles, Mi Ga Lua Hong’s menu is decidedly simple. Either the normal noodle soup (VND 27,000) or the dry version (VND 29,000) are available. It is no doubt that Vietnamese in general and Saigonese in particular love chicken. Unfortunately, overcooked chicken is rampant in many a street food stall in Saigon proving that not many vendors get fried chicken right. However, adequately crispy on the outside but still quite soft and tender on the inside, the chicken at Mi Ga Lua Hong is handled with care. There is not too much to the dish, so you are halfway there once you get your poultry right. To be honest, the noodles are rather underwhelming, but the flavorful broth with hints of fried garlic and five kinds of spices coming with it is awesome. A mean bowl of bun bo Hue, which is tucked away in a narrow storefront along District 3’s Nguyen Thien Thuat, is what you might want for breakfast. 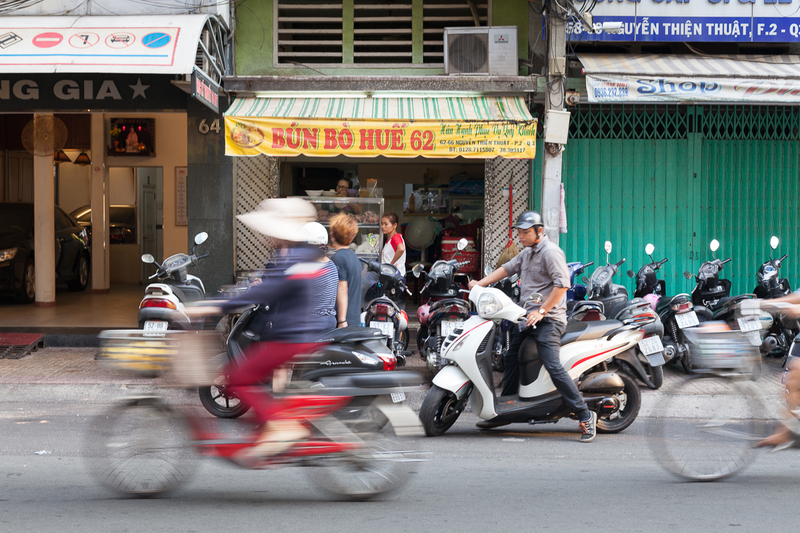 Amid the scores of other food-related businesses lining this small road is the modest noodle shop at no 62 Nguyen Thien Thuat. Even though it is such a busy area, packed with street stalls and shops, it is not too loud considering the crowd it draws. At shop 62, you will experience a fairly standard procedure: walking up to the metal noodle station, putting your order and leisurely walking a few doors down to its dining area. A simple, fresh bowl of noodles, broth, beef and herbs is what you get at shop 62. But don’t let the simplicity make you mistake for mediocrity: its quality is higher than what you might expect at an average bun bo Hue bowl. The noodles are firm, but not overcooked; the herbs have a satisfying crunch and the beef is not stringy or chewy but soft and tender – this particular cook’s attention to detail is spot-on. And the broth – the most important component of the soup – is warm, not over oily and a little bit spicy. This noodle shop opens from about 7AM in the mornings till mid-morning as it closes down for a midday siesta. In the late afternoon, when the shop reopens around 4:30PM for an evening service till around 8PM, you can also find their savory bun bo Hue. Hailing from the Northern Vietnam, rolled cake (banh cuon) is a breakfast staple in Vietnamese cuisine. Thin, tender flour sheets and so much mincemeat filling that it is spilling out of the roll are the hallmark of a good roll of banh cuon. The indispensible part of this dish – egg part of the equation will just come in later. Right after customers makes orders will the owner quickly whisk up two eggs in a small bowl and carefully pour the liquid over the batter. The batter and egg mixture will go onto the hot cloth surface to gradually transform into a delicate thin sheet of egg golden batter. You will be excited to see how nimble her hands are during this process. Your egg rolled cake will be arranged in a neat row and served on a plastic plate. 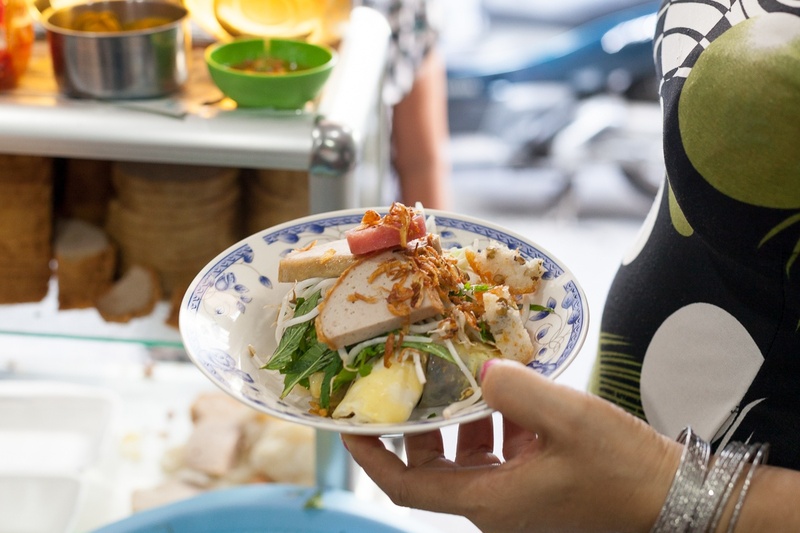 They are cut in half and come along with the simple accoutrements: an assortment of chả – local cold cuts and boiled bean sprouts and diced herbs. The egg addition will improve the rolls’ texture, making them so durable that you cannot even mess it up. 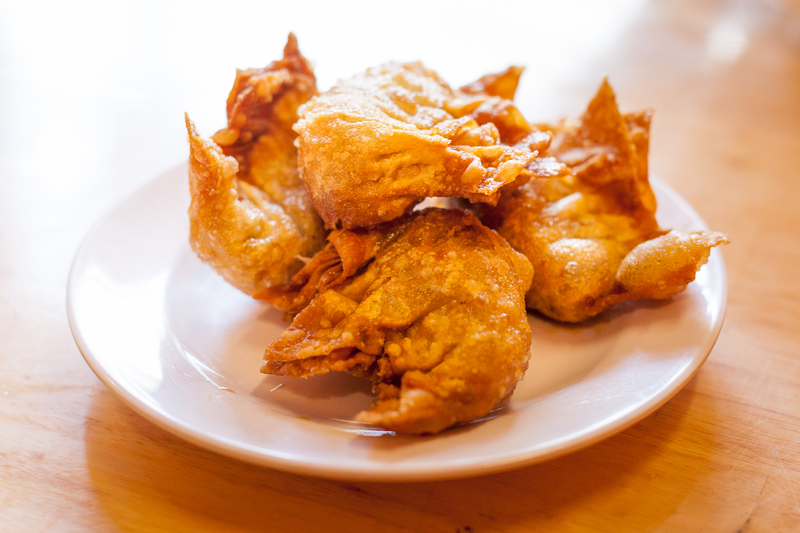 Each bite is a harmonious combination of taste and texture, made better by the slightly sour, spicy and sweet nuoc mam (fish sauce).